Women Of West Africa In Entrepreneurship (WOWe) Conference will take place on the 20th and 21st of June at the Eko Hotel on Adetokunbo Ademola Street, Victoria Island, Lagos, and on the 22nd at the Wheatbaker Hotel on No 4 Opitolo Rd, Ikoyi, Lagos. WOWe is created to meet the needs of the ‘missing middle’ – young educated African women who are driven to start in business. 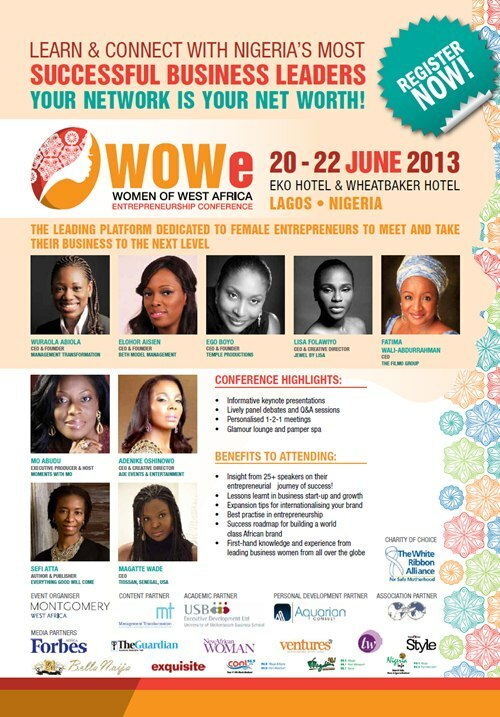 The objective of the WOWe conference is to raise the profile of excellence in entrepreneurship to Nigerian women between 18 – 40, as well as profile and promote young upcoming female entrepreneurs. The Event will be organized by Montgomery West Africa. Montgomery is a global British headquartered events company with over 100 years’ experience and Montgomery Group is responsible for organizing some of the major events in Africa. Montgomery believes in Africa’s potential and success, which is why they own the largest exhibition space and venue on the continent and have been operating in Africa since 1968. In 2009 they incorporated their West African business in Nigeria, and are committed to supporting the commercial sector in the region by developing shows that create business opportunities, effective networking and build capacity. It is widely accepted that creating entrepreneurial opportunities and building capacity in financial literacy, business and financial management and ICT for women and girls is critical for economic development and prosperity in Nigeria. However, while there are many high profile initiatives, funds, grants and training programs available to empower and support women in this regard, there isn’t an impartial national platform that allows all the key stakeholders in this sector to meet. Additionally, many women entrepreneurs are not aware or have the skills or network to take advantage of these initiatives designed for their development. In fact some of the funds and special budgets allocated to support women entrepreneurs remain unspent in Nigeria. WOWe has been developed as a national platform to address these issues through an accessible “edutainment’ and chat show format - all making entrepreneurship accessible through interactive panels, Q&A sessions, prequalified meetings, keynote presentations and participation from young upcoming female entrepreneurs. WOWe promises to gather women from all walks of life from Women Entrepreneurs (primarily aged between18 – 40) to Banks and financial services organizations to Development finance and impact fund investment institutions to Government agencies with responsibility for women empowerment, SME development to Corporate organisations with interest in women empowerment and development to Women and Entrepreneurship NGOs and Charities and ICT & Mobile companies. This event will be one of the largest Women Entrepreneur Conferences to hold in Nigeria.